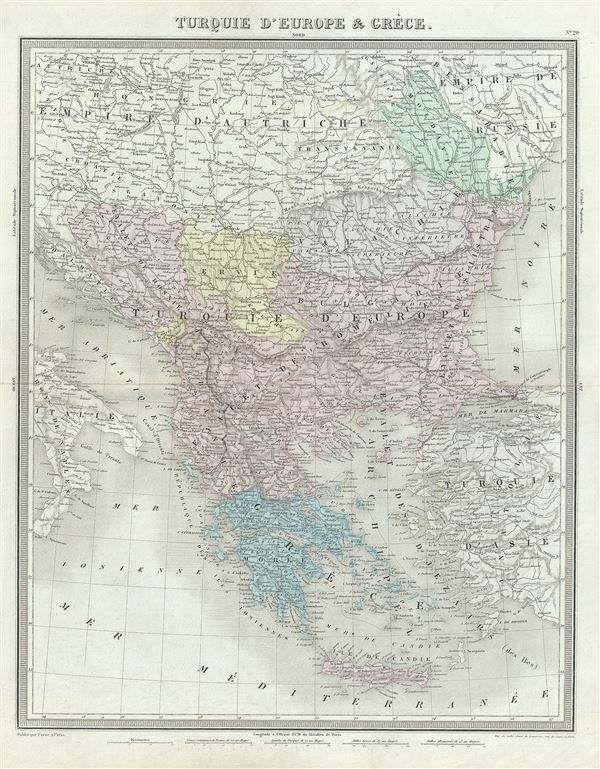 This is a beautiful 1874 map of Greece, the Balkans and the European part of Turkey by Ambroise Tardieu. It covers from Moldavia to Candia or Crete and from the Gulf of Venice to the Sea of Marmara. The modern day states of Greece, Albania, Moldova, Bosnia, Croatia, Serbia, Bulgaria and Romania are included. Throughout, major towns, cities, rivers, mountains and other topographical features are noted. This map was made when the Ottoman Empire controlled much of the region. It depicts the waning years of Ottoman hegemony in the region, with the Greek nationalist movement attaining independence for the Peloponnese in 1821. The Ionian Republic, under the protection of Great Britain, was also free of Ottoman control. The other Grecian and Balkan states, including Serbia, Croatia, Moldavia, Wallachia, Albania, and Macedonia, remained at least nominally under Ottoman control until 1878. This map was prepared by Ambroise Tardieu and issued as plate 20 in his 1874 edition of Atlas Universel de Geographie Ancienne et Moderne.